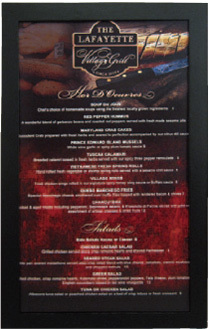 Our all new Menu Frame is a fun option for displaying your restaurant, cafe or bar menu. The 3/4" wide frame can display paper menus on both sides, allowing you to create a two-sided menu, or use one side for special promotions and happy hours. The top loading design allows you to easily swap out paper menus, making it easy to update pricing, add specials and make seasonal changes. 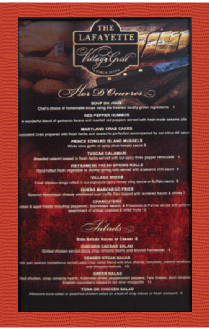 A wide range of colors, materials and sizes makes it easy to get a frame that suits your menu design. This menu frame has a hardback and includes clear vinyl sheet protectors. 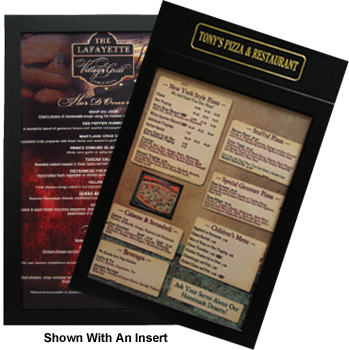 Menu Frames with the optional 2" header can also be customized with your logo.